Low prices on chick starter kits, brooders, feed, chick coops, learning tools, and everything you need to keep your baby chicks healthy and happy. Getting a chick starter kit can be convenient especially for beginners who may not be sure of exactly what you need. Shop Chick Starter Kits & Supplies Here! Get the best deals on complete chick starter kits and baby chicks supplies! Top quality, name brand, hand selected deals just for you and your peeps! And much much more! Scroll down to see our top deals of the day! Unfortunately, I have been unable to locate a chick starter kit that carries all of these items. However, you can purchase these items separately. I have listed them below. Baby chicks have higher protein, vitamin, and nutritional needs than adult chickens as they are growing very fast. Giving a baby chick regular laying feed or scratch will not supply these needs and feeding your baby chick feed that does not supply the protein, vitamins and nutrients they need to help them grow could result in severe health issues such as wry neck syndrome, splayed legs, and even death. Some people feed their baby chicks mashed up peeled, boiled eggs as a feed supplement and it seems to work very well, in spite of the fact that feeding eggs to baby chicks is kind of cannibalistic if you think about it because you would be feeding unborn baby chicks to live baby chicks. Baby chicks need a good starter feed in order to get a healthy start in life, to build strong bones and muscle. Baby chicks need extra vitamins and electrolytes. It is a good idea to provide a vitamin and electrolyte supplement. Most can be added to the water or sprinkled over feed. I use DURVET vitamins and electrolytes for baby chicks, pullets and adults and it works very well. I have used Rooster Booster and it works well too. I noticed improvements in the birds overall appearance, and activity levels within a few hours. It really made a huge difference when I separated the chicks into two groups. I gave one group of baby chicks vitamin and electrolyte supplements and did not give them to the other group. The group that received the supplements grew faster, were more active, and were healthier even when they grew to adulthood. Newly hatched baby chicks need to be kept in a temperature controlled environment in order to survive. Temperature should be maintained at 95F-100F degrees for the first week. Temperature should be reduced 5 degrees every week until they grow their feathers. You can use brooder lamps or brooder plates to accomplish this. I prefer the Brinsea EcoGlow Brooder because the baby chicks can huddle under it if they are cold and move away from it if they are too hot. Baby chicks can die very quickly from water spills. Waterers should not be large enough that the chick can step in them. I use marbles or aquarium glass rocks in the water tray of my baby chick waterers. This prevents them from getting into the water, holds the water container steadier which lowers the chances of the water container being overturned, and allows them to get the water they need. Your baby chicks need to be housed safely. Brooder Box-For the first few weeks your baby chicks should be kept in a brooder box where you can control the temperature. Brooder boxes prevent the baby chicks from escaping. You would be amazed at how some smart baby chicks can squeeze out of the tiniest openings. The Problem with using Cardboard boxes for Baby Chick Brooders-Many people keep their baby chicks in cardboard boxes as they are disposable and the chicks cannot get out. The problem with cardboard boxes and heat is that there is an extreme chance of starting a fire, especially if you are using a brooder lamp for heat. Dry cardboard can ignite when it gets too hot. 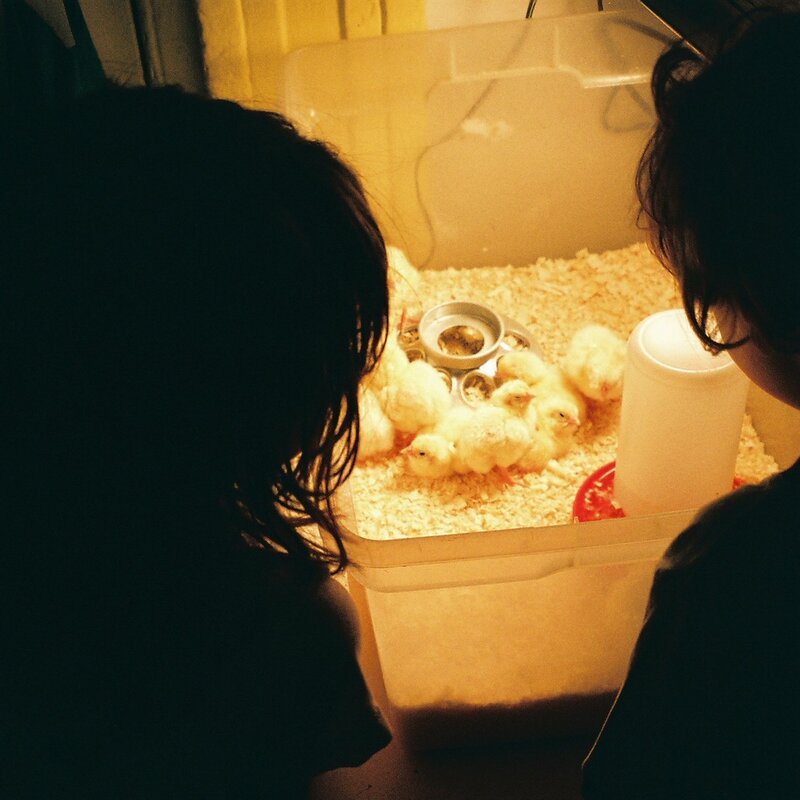 Brooder lamp safety tip-Brooder lamps usually come with a clamp. Do not depend on the clamp. Only get brooder lamps that have porcelain fittings for the light bulb, plastic will melt over time. Wire the brooder lamp in a cage that has a metal bottom and do not put it in the same cage as your baby chicks. If a brooder lamp falls from it's clamp it will fry your baby chicks and can easily start a fire. Brooder heating plates are much safer. Pet Cages-Baby chicks should not be kept in a cage because they may be able to squeeze out of the openings between the bars. If you do decide to use a pet cage, you can secure it by attaching hardware cloth to all sides. Brooder heat plates-Much safer than heat lamps, most allow you to adjust the height as the baby chicks grow. Grower Cage or Small Chicken Coop? Baby chicks will quickly outgrow their brooder box and will need to be placed in a grower cage to allow them more room to get more exercise but they still need protection. Many brooder boxes and grower cages do not have a top on them, which does not make sense to me because this leaves baby chicks unprotected from possible predators and accidents. Wherever you decide to keep the chicks they need to be protected on all sides including top and bottom and their brooder, coop, or cage needs to be well ventilated. Once my baby chicks grow feathers I use a rabbit cage to keep them in at night or a grower cage. I put a small chicken coop in a covered area outdoors and near my flock. I put them in the outdoor coop during the day and my existing flock gets a chance to meet them. The problem I have discovered about many coops you can buy online is that they do not hold up to inclement weather so I make sure mine are under a patio type covering I make with wood and tin to protect the cage or I bring the cages indoors in bad weather. My baby chicks love the freedom and get plenty of exercise in these small coops with runs. I have found this coop to be very useful when I need to keep chicks indoors and under supervision. It is small enough to move around if I need too and to take outdoors on nice days but large enough to give up to 10 baby chicks room to roam around in. I have also used it to put a hen and her chicks in to protect them from the flock. When I use it outdoors it is in a fenced in area so I can open the door and let the chicks or hen and chicks out to get some free range time without directly interacting with the flock. I actually have two of them. One indoors and one outdoors in the pen. At night I grab a box and collect the chickies and their Mom from the outdoor coop and take them to their indoor coop. They soon outgrow it but by the time they do my flock is used to them and readily accepts them into the flock. I have also used these to contain sick chickens who needed to be separated from the flock. They are easy to clean, light weight, and the price is right. If your baby chicks are moving away from the heat source, panting, gasping, holding their beaks open or holding their wings in an upward position it means it is too hot which is another reason I prefer Brooder heating plates. Chicks can move away from them if they are too hot or get under them if they are too cold. 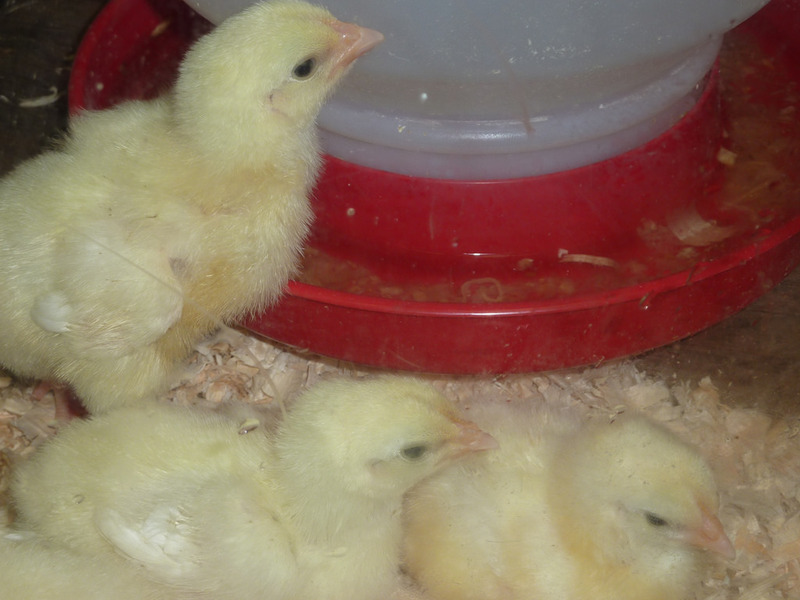 Get the Best deals on feeder's for baby chicks. Feeder base, bulk feeder's, feeder troughs-galvanized and plastic trough feeders with flip tops plus a whole lot more! Don't miss out on these great deals. List of various breeds of chickens with details about their size, broodiness, egg color, weight, and personality types.